Today is the 50th anniversary of Lego building blocks! Mine spent the day celebrating quietly under a plastic bin of Star Wars Action Fleet, which is under a bin of Transformers Beast Wars toys. 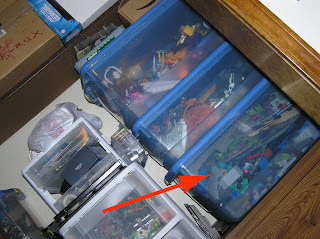 "Oh my GOd, Doesn't he know that plastic bins like that will seriously limit the lifespan of those toys!!!?" The next Lego sets I want? The Indiana Jones sets-- I really hope they make the tank form the last Crusade--but I know lego doesn't like those war toys--(but then there is Star WARS) I also want the SpongeBob Rocket set with Sandy the squirrel. Thats really all I want it for, is the squirrel of course. And finally, I want the Death Star so I can throw it down my parents stairs and slow-mo the whole thing. Happy 50th Lego? I can't wait to see what the 100th sets look like... Probably bricks that fit together without any bumps! Welp, I lost Star Wars RISK. Any stategery of mine failed. Bryan's forces were too powerful to even pick back at. Andy and I played each other friendly forces, and still got rolled over. I discovered too that I am an amazing low roller, rolling three ones in a row, and other times rolling one number lower than Bryan many times. At least I still have my Trivial Persuit crown. Next week, I'll bring in some Star Wars Attacktix. See if we can set up a small bracket play-off tournament (with shop protective gogles of course). And the next week I think we will try Star Wars Stratego in a similar playoff fashion. Then we will need to start looking for other Star Wars related games. I was sure I once saw a Darth Vader Operation game, but I can't seem to located it on ebay. Continuing January's Tradition of weird things that happen at the Toy Museum, I bring you The Toy High Dive of 2008! Vote by a score of 1 through 10 your favorite diver (by the comments section). The two most popular divers will go head to head on a super high diving platform! Enjoy! Star Wars Clone Wars RISK-- I'm in big trouble!!! Playing Star Wars Board games during friday lunches is becoming a tradition at my job. Well at least 2 weeks of tradition, and at least one more, because we didn't have time to finish Star Wars RISK. Unfortunatly I'm Red, and I'm in a really tight spot. I was only able to hold the Outer Rim for one turn, then it fell again. I don't have a whole region of space to get the much needed extra troops per turn. I'm afraid Andy or Bryan will destroy me early next game. Unless they become so enraged with each other, I can somehow sneak back into the game. I did come from behind in Star Wars Trivial Persuit and defeated Andy to win that game. Bwa-ha-ha! We took this picture as proof of where to place the units next time. And so no Kramer vs Newman Tom foolary takes place, Bryan also has a picture. I was tempted to photoshop some extra pieces into my territory, or change the colors on the pieces to my favor. Also, we played closer to regualar RISK rules. Star Wars Clone Wars RISK looks like the most complicated game ever created. Just 11 simple steps plus bysteps to master and then its go time. Also, Also, I just learned today I have been playing Star Wars Attacktix all wrong! I reread the rules today, like I have done a thousand times, and just noticed you can move as many figures you want per turn as long as its no more than the tix allowed!!! For some crazy reason I had it in my head you could just move the two figures that were the attacking figures! Gad this changes everything. I can't believe I was so STUPID to miss this. Oh well, I like the game more for collecting the figures than playing--but maybe now I will like playing more, because I will be doing it right. ALSO, also, also, if anyone has any suggestions on how the Outer Rim will take back the Galaxy Far far away--PLEASE let me know!!! 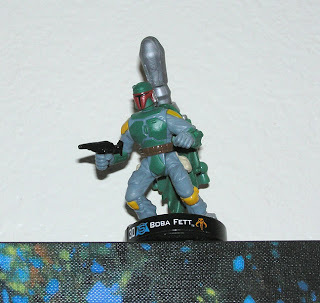 Does your Boba Fett Attacktix also fly up onto cheap paintings and shoot you from above? I'm getting excited for the release of series five Star Wars Attacktix, and series two of Marvel Attacktix. Its kind of quiet on the toy aisle for great finds of late. I miss the thrill of buying a whole bunch of mystery packs and finding out they all have the same lame figure inside. Interesting side note, Baba Fett is my first Attacktix with a backpack projectile launcher. He takes a bow, and POW! Finally 'What is in the cart?' revealed! 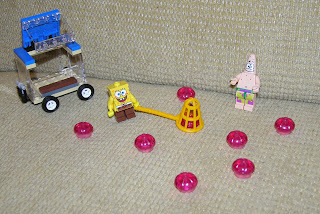 8 Jellyfish were in the cart of course! 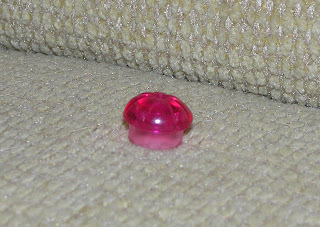 SpongeBob and Patrick like to collect them on my couch. I'm glad they do, because one time they didn't, and I had quite the investation of jellyfish in my pants after watching tv. 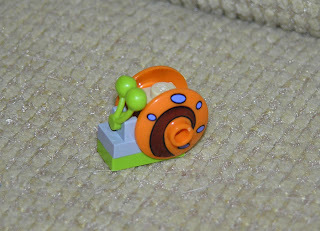 By the way, isn't Gary the greatest or smallest Lego creation ever made? My new years resolution is to sell about 200 dollars worth of toys, purchase the Lego Star Wars Death Star, take a punishing week building it, and then drop it down my parents stairs to the basement, just like when I was younger. Don't worry, I will YouTube the event for sure. I might need P.D.o.G.U. help though, for the documentary of course. and maybe a powerfull vacuum. Guess what is in the cart? I start 2008 with a quiz! 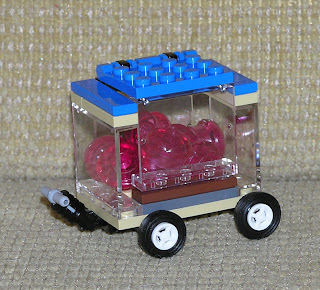 What is in this lego cart? And super extra credit given to the one who quesses how much of what is in the cart is in the cart correctly!